Guys… It’s HERE! 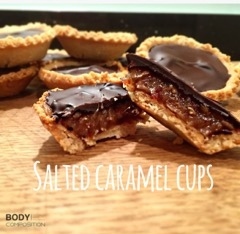 Salted Caramel Cups courtesy of the very talented Ashlee Winstanley from our friend at Body Composition. The countdown to Christmas has officially begun!! Who is up for a bit of Christmas baking this weekend? Grease a muffin tin with a little coconut oil, remove dough from fridge and roll out (or press down with hands) then cut circles with a cookie cutter. Fill all muffin cases with pastry and bake for 10-15mins until slightly golden. Let pastry cool, meanwhile remove dates from water and place the dates in a food processor with a little almond milk, ½ teaspoon of caramel flavouring and a pinch of sea salt. Blend until smooth paste. Fill each tart with the date caramel. And set aside. In a glass bowl melt the chocolate in 30 second bursts in the microwave until glossy. Spoon over the chocolate and cover the caramel, pushing the chocolate all the way to the pastry edges. Enjoy and be sure to tag us in all of your baking creations via the social media links below.